The Wagner Group, a private military company with ties to the Kremlin, may secure military contracts in Sudan and the Central African Republic. Military engagement with Russia will enable Sudan to maintain a greater balance in its foreign policy. Entering the Central African Republic will allow the Kremlin to earn more cash and drum up more business across the continent. Today, I’m going to look at a mantra much trumpeted by environmentalists; the precautionary principle. I’ll seek to make a case that, since the early 1980s, this idea has been perverted. To such an extent, that the principle now has an effect all but opposite to its true intention. I’ll trace how this happened, and try to outline how we might fix the resulting mess. Crude oil prices dropped from $110 a barrel in the summer of 2014 to about $30 in January 2016. The effect on oil producers and oil-producing countries was dramatic. The Russian ruble plunged, and the Canadian dollar slipped to below 70 cents US for the first time since 2003, kicking the country into recession and snuffing out the oil boom in Alberta. Many foreign companies operating in the high-cost Canadian oil sands pulled up stakes. The United States has more coal than any other nation. With modern coal-fired power plants, it can be used to generate very inexpensive electricity, with virtually no significant pollution: about the only thing that comes out of the stacks today are water vapor and carbon dioxide, the miracle molecule that helps plants grow and makes life on Earth possible. Even though coal-based electricity has plummeted from 52% of all US electricity in 2008 to 30% by the time President Obama left office, it still helps to keep the lights on and keep people warm in all but a few states. Rates continue to rise, though stocks remain oblivious. 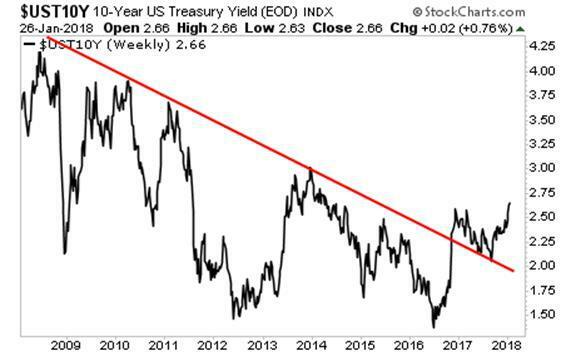 The yield on the 10-Year US Treasury continues to soar, with a confirmed breakout from its 10-year downtrend.